Join us for a guided glacier experience you will never forget! 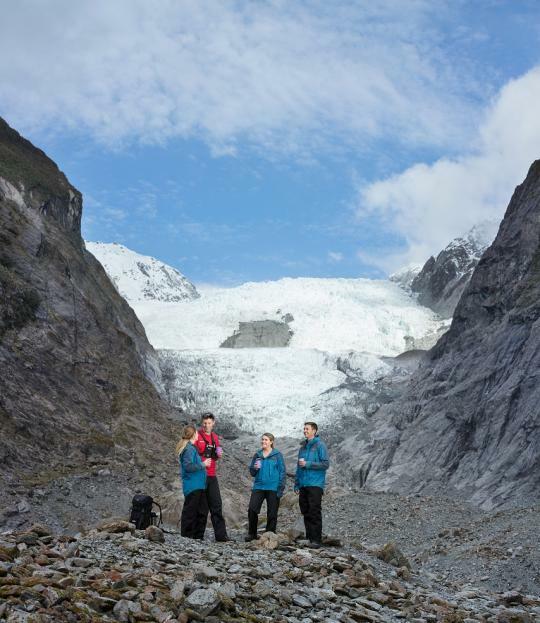 Franz Josef Glacier Guides are proud to offer a range of world-class experiences designed to show you the very best of New Zealand's West Coast glaciers. 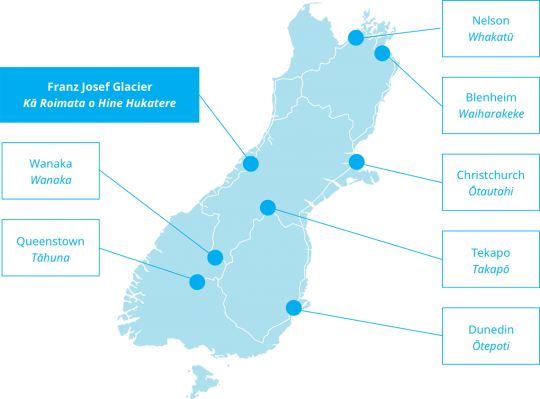 Thanks to our detailed knowledge of the glacier region, you'll come away with a whole new appreciation for Kā Roimata o Hine Hukatere (Franz Josef Glacier). But it's just as important that you feel safe throughout your trip. Our guides have a great deal of experience and are highly skilled in finding the safest and most spectacular route for you, whether that's up on the ice or across the valley floor. Each trip is tailored to the ability of your group as well as the conditions of the ice and valley on the day. Spaces are limited on our trips so be sure to book early! After an exciting brief flight over rugged terrain, you will land on Franz Josef Glacier ready for a three hour guided hike. 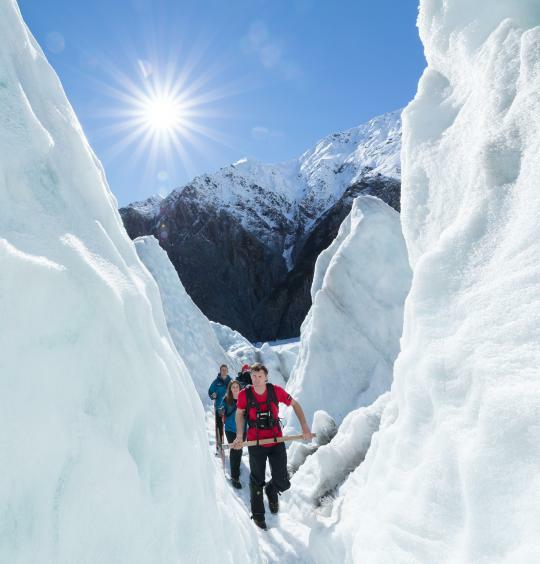 Your guide, with an eye for the most spectacular ice formations, will lead you through some of the most awe-inspiring glacier scenery Aotearoa (New Zealand) has to offer. Your Glacier Valley Walk will take you up alongside the mighty Waiho River bed following the glacier's path of retreat in this remarkable landscape. Here you will learn about the glacier's history, see what is left behind by this majestic giant, and learn the legend of Kā Roimata o Hine Hukatere. Under the expert tuition of our experienced guides, we will introduce you to the exhilarating sport of ice-climbing, whilst still enjoying the spectacular scenery of the Franz Josef Glacier. Your guide will tailor the day to challenge novices and experts alike. No experience necessary. Franz Josef Glacier (Kā Roimata ō Hine Hukatere) is one of the steepest glaciers in New Zealand, descending from its origins high in the Southern Alps deep into the lush native rainforest of Westland's National Park. It also moves faster than your average glacier at around 50cm per day. This creates some truly incredible features in the glacier such as ice caves, tunnels, seracs and crevasses; all of which are constantly changing and evolving so no two days are ever the same. Franz Josef Glacier is located in the beautiful Te Tai o Poutini (West Coast), a scenic 5 hour drive from Queenstown or 2.5 hours from Greymouth. Congratulations to our Wanna Win a Refund winner for March! Every month one lucky person wins a full refund of their trip. Be sure to upload your favourite trip image to our Facebook page or on Instagram and use #wannawinarefund to enter.